Wenger hasn’t finished beneath Tottenham in the English Premier League in 18 seasons and looks to extend his record. New Spurs manager Pochettino looked to give his team their 50th win in the league against Arsenal in his first North London Derby. This was a game of many ups and downs for Arsenal with 2 injuries causing substitutions before halftime. The controversial Goal-Line Technology also makes an appearance in this match between North London rivals. Arsenal controlled the ball while Pochettino’s men looked to find success through counterattacks. Starting lineups and formations for both teams. Arteta dropped into the defensive line constantly for Arsenal in order to help keep the ball. Arsenal was able to dominate possession in this match due in part to this movement coupled with their patience in possession. Ramsey had mostly a vertical role where he moved very high in attack and occasionally dropped deeper to help build possession out of defense. Gibbs moved very high and occupied the left flank as Ozil moved inside or dropped deep to receive the ball in the center while Oxlade on the opposite side stayed wide and Chambers didn’t have as vertical of a role as Gibbs. Welbeck acted as a swerving forward making many runs out into wide areas in order to balance the teams offensive structure. Wilshere had a free role in the middle of the park. 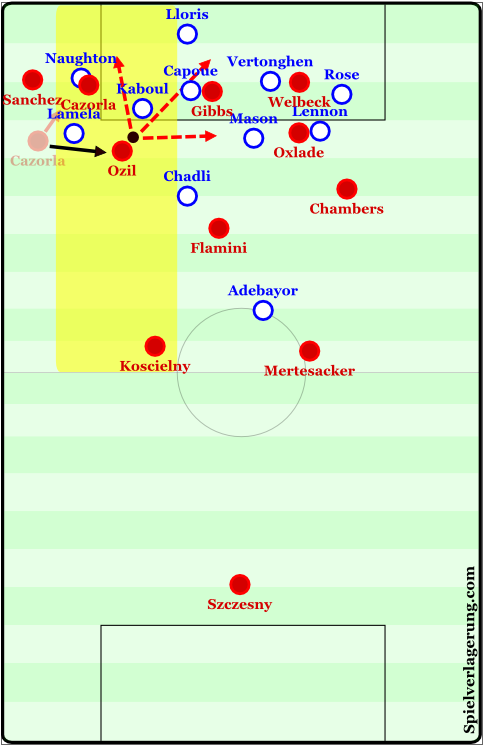 On top of this all of Arsenal’s players were very fluid in their positioning and interchanged positions many times, especially Ozil and Wilshere. For Spurs, Adebayor was the focal point of the attack. He dropped deeper in order to help his team transition out of defense and even made wide runs to provide an outlet. Chadli mostly stayed higher and looked to get in behind the Arsenal defense. Lamela and Eriksen both moved inside from wide areas with both fullbacks pushing up for Tottenham. Capoue acted mostly as the anchor man in midfield. On his debut for Tottenham, Mason had a more vertical role in central midfield. Pochettino’s defense seemed quite stable, but it wasn’t. 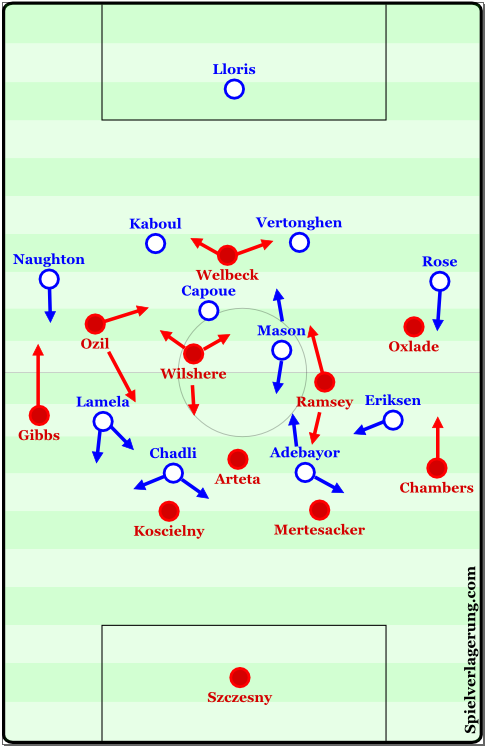 Spurs were situationally quite compact and stable when Arsenal’s possession began in the center and tried to progress through the center of the field. Though when Arsenal were able to move the ball wide Tottenham immediately became stretched. The lack of horizontal compactness was immediately recognizable as soon as the ball (orientation point for a defense) moved wide and caused Tottenham to move their shape out from the center. When this happened the midfield 4 of Pochettino’s men had large spaces in between each other, particularly in the halfspaces. Ozil, Wislhere, or Ramsey receiving the ball in these areas and moving diagonally towards goal were Arsenal’s brightest moments in the first half. Oxlade tended to stay wide and if he ever did move inside he played his passes into wide areas more often. Still, Arsenal did not have optimal positioning while in possession and could have moved the ball much better than they did. When Spurs had the ball Arsenal set up in a 4-1-4-1 shape. One of the 8s would situationally move forward in order to help Welbeck press the defense. The 8 that would step up in order to help Welbeck stayed asymmetrical in relation to Welbeck. This created a ‘strong’ side and a ‘weak’ side of defense, meaning it made the shape seem as if there were more defenders on one side than the other. If Tottenham moved the ball to the ‘strong’ side of Arsenal’s defense then they would be easily pressed and isolated down the flank. If the Spurs moved the ball to the ‘weak’ side then the opposite central midfielder would move out of Arsenal’s shape to press the open player, maybe forcing a pass to the crowded center. Though usually this pressure also ended up in forcing Spurs wide. Tottenham’s strongest phases were in transition. When Arsenal lost the ball they had no real counterpress. Along with this, the infamous lack of defensive workrate in transition of some of Arsenal’s players made it easy for Tottenham to progress forward and combine in transition. A memorable moment came when Mason ran past Arsenal’s entire midfield before Chadli played him a pass from the wing. Mason performed a poor cross with no pressure on him towards Adebayor which surely would’ve resulted in a goal on another day. The second half began at 0-0 with Arsenal having already made the switches of Flamini for Arteta and Cazorla for Ramsey due to injury in the first half. Later Lennon came on for Eriksen and Sanchez for Wilshere (who also might’ve picked up an injury). Dier came on for Rose and Bentaleb for Chadli late in the game as well. Arsenal came out in the second half with a change of rhythm in play. They moved the ball wide and combined in the halfspaces often and very quickly. Cazorla, Ozil, and Sanchez were doing most of this work. 5 minutes into the second half Ozil had a nice chance when the ball was played wide then inside to the opened interior space. Flamini had a poor touch and turn under pressure right in the middle of the field when Arsenal were building out of the back under pressure. This Tottenham press resulted from a quick throw of the ball out the a defender from Szczesny while Pochettino’s men were still quite high up the field. This led to a ball loss and a direct through ball to Chadli who made a run peeling off of the back of Koscielny and finishing towards the far post for the lead. Arsenal finding Ozil in the halfspace and improved movements in their diagonality from this space. The Gunners improved a lot in their circulation which led to more possibilities in their diagonal movements from within the halfspace. In the above image it is easy to see Ozil received the ball with space while Mason was far away and Capoue was in the box. Kaboul had to step up against Ozil. Here Ozil had many different options with an excellent field of vision facing diagonally inside towards goal. He could’ve dribbled across the goal in order to eliminate even more defenders from the play, or he could have shot at the goal or played a through pass from a favorable angle. Ozil chose to dribble vertically which was the ‘widest’ of all options and put a cross in, this led to Chambers’ near volley goal. Gibbs was able to receive the ball in these situations many times as well and decided to move wide and cross the ball in rather than play the ball into the open interior areas, which maybe could have been more beneficial. Finally, Sanchez found Cazorla in a similar situation open in the center. Cazrola let off a poor shot which led to some awkward movement in the box as the ball was moving towards the back post before Oxlade scored. Arsenal continued the rest of the game in a similar fashion but mostly ended their movements with crosses rather than shots or direct dribbles. In the end, this was probably a fair result. Neither team was quite good enough to deserve a win over the other. Arsenal yet again have more injuries to worry about (Raymond Verheijen is not pleased), threatening their various championship hopes. Pochettino made minimal progress in trying to finish in the top 4 and above Arsenal, moving from 9th place to 8th place in the league from this draw. Arsenal remain in 4th place (remaining undefeated as well!) of the English Premier League, but it looks like it will be tough to sustain such a position with their fitness troubles. The goal-line technology is not controversial at all. Best thing ever introduced in the game. Goal-Line Technology has caused a large amount of debate among the people making the rules. Though you and I are on the same side, it is a positive for football.